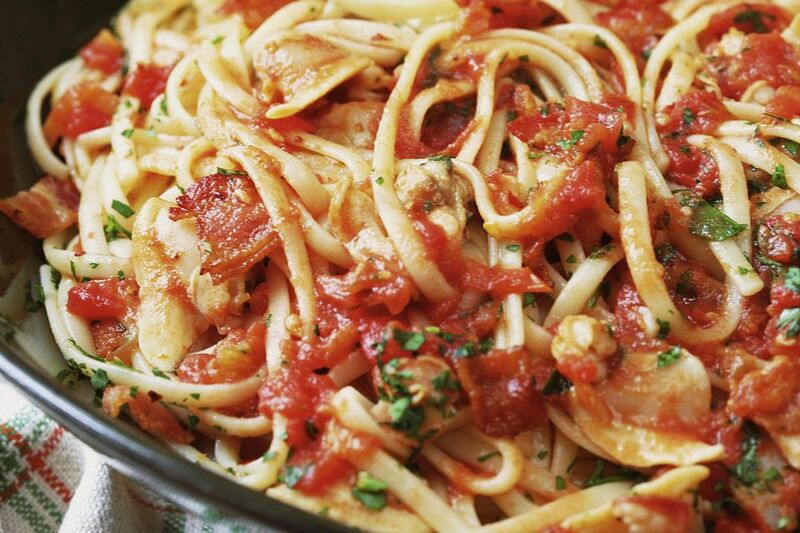 Whether it's spaghetti, linguine, or fettuccine - pasta with red clam sauce is a classic dish in Italian-American restaurants. But it's an easy recipe to make at home, so there's no need to go out to enjoy this delicious seafood pasta. Add the olive oil, garlic, anchovy, capers, and red pepper to a large saucepan, and turn on the heat to medium. When the garlic begins to sizzle, and before it starts to brown, add the wine. Cook until the wine reduces by about half. Stir in the tomato sauce, clams, and juice. Bring to a gentle simmer over low heat. Stirring occasionally. Boil the pasta according to the directions on the package. Drain, but do not rinse. Add the spaghetti back to the pot in which it was cooked, and pour over the clam sauce, and basil. Toss with tongs to coat the pasta with the sauce. Cover and let sit for 2 minutes to absorb the flavors. Taste and season with salt if necessary. Serve hot with Parmesan if desired.